Their history of visits to the seaside town may be relatively young but Fleetwood has quickly emerged as an undesirable daytrip destination for Doncaster Rovers. They may not have sunk to the depths of their horrendous performance on their first ever visit to Highbury last season, but there was little evidence on Saturday to suggest it is going to become a happy hunting ground any time soon. In the aftermath of the weekend’s dour goalless draw, Darren Ferguson was incredibly disappointed in Rovers’ performance. And it must be said, it was a long way off the standards which have been set since he took charge of the club three months ago. 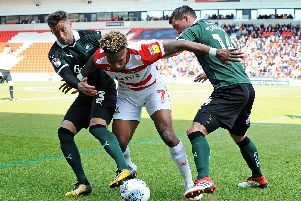 Possession was conceded far too cheaply, denying Rovers the chance to build their rapid attacks and hurt Fleetwood on the counter - something they looked vulnerable to as they committed full backs forward. It made for an incredibly disjointed performance where Andy Williams and new strike partner Lynden Gooch were isolated, starved of the service Rovers have been more than capable of producing in recent months. Defensively, there were few faults with Rovers’ performance, though Gary MacKenzie certainly looked rusty on his first start in three months. MacKenzie - replacing the injured Andy Butler in the middle of Rovers’ back three - was one of the worst offenders for giving the ball away until being replaced by Mitchell Lund in the second half. But overall, particularly inside their own box, Rovers defended well, restricting Fleetwood almost entirely to efforts from distance. In terms of memorable features of the game, the first appearance of Rovers’ latest loan signing may be the only item of real note to take forward. For Gooch, it may have not been the most memorable debut but he showed signs of the dangerous player his reputation suggests he can be. Gooch has a tremendous amount of power and strength from a low centre of gravity. His play is consistently direct, running at the opposition defence and using his physicality to beat his marker. If Saturday’s game was anything to go by, the United States U20 international is singular in his intent. Operating from deeper than the front line, he powers on goal and will shoot on sight. He could easily have had the picture perfect debut goal, but for the alertness and fingertips of Fleetwood keeper Chris Maxwell. Gooch surged inside from the left and smashed a curling effort from the corner of the box which seemed destined for the far top corner until Maxwell tipped it over. It would have been the blockbuster moment to awaken the game from its slumber but unfortunately, such a piece of quality would never arrive. There were other moments, such as when former Chesterfield midfielder Jimmy Ryan smashed an effort off the bar from 25 yards in the later stages. But this was ultimately a game severely lacking in thrills. Very early it looked likely to be one of those games where things would not happen for Rovers. And before long, it looked to be the same for Fleetwood too despite some decent build-up play from the hosts. Their biggest threat came from the wide areas, particularly through Everton loanee David Henen on the left who was ably supported by full back Amari’i Bell. Henen regularly found space for a cross or to cut inside but his end product was lacking and he let Rovers off the hook on a number of occasions. It was a bad afternoon for his fellow Everton youth product in the Rovers camp in Conor Grant. The typically influential midfielder had barely settled into the game before he was forced off with a dead leg. Grant’s replacement Richard Chaplow proved a more than adequate stand in and was arguably Rovers’ most threatening player in the second half when his runs from midfield made up for the shortfall in service. Fleetwood’s 4-3-3 system saw them find plenty of space between Rovers’ lines and they exploited it well to take the more meaningful possession. Bell volleyed into the sidenetting from Henen’s superb cross to the back post in the best of their early chances. Rovers came into the game and enjoyed their best period after the midway point of the half. The off-colour James Coppinger worked his way into a brilliant position only to somehow put the ball out for a throw in with his shot. Then came Gooch’s almost stunning strike before Chaplow twice went close from outside the box. After the break, Rovers’ best chance of the game fell to Williams who was sent clear by Coppinger’s pass only for Maxwell to tip his low shot away. The introduction of Fleetwood’s new loan signings Devante Cole and Alex Kiwomya gave them fresh energy in attack but Ryan emerged as their biggest threat. He curled a free kick into the side netting shortly before his piledriver smashed the woodwork. Ryan had the last real effort of the game, drilling narrowly wide from 25 yards but the destined goalless draw would play out. The overall picture for Rovers remains positive. Saturday’s game was only the second time in the last 11 matches where they have failed to score and their run of league form now stands at one defeat in nine. But if they are to gatecrash the play-off party come May they cannot afford many more performances like Saturday’s. Fleetwood: Maxwell 7, McLaughlin 6, Pond 7, Davis 7, Bell 6, Ryan 8, Jonsson 7, Sarcevic 7, Grant 6, Haughton 6 (Cole 59 6), Henen 7 (Kiwomya 59 6). Subs not used: Jordan, Forbes, Nirennold, Hunter, Gocic. Rovers: Stuckmann 6, McCullough 6, MacKenzie 5 (Lund 58), Taylor-Sinclair 6, Alcock 7, Coppinger 5, Keegan 5, Grant (Chaplow 17 7), Evina 5, Williams 6, Gooch 7. Subs not used: Marosi, Davies, N’Guessan, Mandeville, Main.